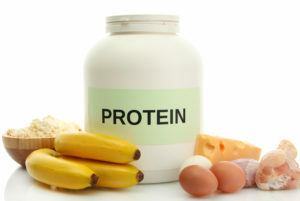 A group of researchers assessed the protein requirements for strength athletes and found that a low protein diet consumed by these athletes resulted in reduced protein synthesis when compared to medium and high protein diets. Whole body protein synthesis was not different between the medium and high protein groups. However, in the high protein group, leucine oxidation increased, indicating a nutrient overload. This suggests that the high protein group consumed more protein than required by the body. To summarize, the protein requirements of athletes are higher than the sedentary population, in order to support muscle recovery and growth. Example: What does a medium protein diet (1.4g/kg of BW of protein) look like for a 180 lbs male? Tarnopolsky M. A., Atkinson S. A., MacDougall J. D., Chesley A., Phillips S., & Schwarcz H. P. (1992). Evaluation of protein requirements for trained strength athletes. Journal of Applied Physiology, 73, 1986–1995.